Piping Specialties Inc. (PSI) is one of the northeast's largest suppliers of valves; process controls/instrumentation, and engineered mechanical specialties. Industries served: Power Generation, Pulp/Paper, HVAC, Water/Wastewater, Food/Beverage, Life Sciences, Chemical/ Process, Semiconductor. For more information visit PSITeam.com or call 800-223-1468. 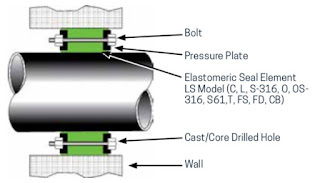 Considered to be the premier method for permanently sealing pipes of any size passing through walls, floors and ceilings, LINK-SEALS® are a modular, elastomer sealing system that creates a permanent, hydrostatic seal for nearly any cylindrical object as it passes through a barrier. With LINK-SEALS®, any cylindrical object may be quickly, easily and permanently sealed against the entry of water, soil or backfill material. coating. Corrosion resistant 316 stainless steel available for maximum corrosion protection. Manufactured in an ISO 9001certified facility. 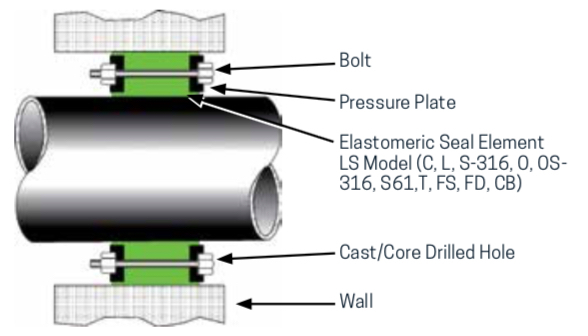 For more information about LINK-SEALS®, contact Piping Specialties, Inc.
Also known as eductors, jet pumps operate on the principles of fluid dynamics. An operating fluid medium, which is referred to as the MOTIVE, placed under pressure, enters the inlet and is forced through the nozzle where it is converted into a high-velocity stream. This high-velocity stream decreases the pressure in the suction chamber, creating a partial vacuum that draws the suction material into the chamber where it is entrained by the motive medium. Once the SUCTION stream is drawn in, shear between the motive medium and the transported material causes both media to be intermixed and pumped out the DISCHARGE outlet, dispelled at a pressure greater than that of the SUCTION stream but lower than that of the MOTIVE. This basic principle of fluid dynamics is what makes jet pumps work. This function is the power phase of the pumping operation. At this stage, the velocity of the motive medium increases as it passes through a nozzle. This phase of the pumping operation takes advantage of the kinetic properties of the motive medium, whether it is liquid, steam or gas. Because of this, design differences may exist within the motive connection of the jet pump. For instance, jet pumps with liquid motives use a converging nozzle, since liquids usually cannot be compressed. On the other hand, jet pumps with gas or steam motives use converging/ diverging nozzles to achieve transsonic flow velocity. 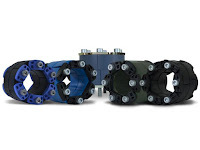 The critical flow paths of all jet pumps are machined smoothly with no abrupt turns or steps in order to produce the most efficient flow during the motive function. Without this direct flow design and smooth interior surface, the jet pump would not operate at peak efficiency. This connection is where the pumping action takes place. The high velocity stream of the motive causes a drop in pressure in the suction chamber. This allows pressure in the suction vessel to push a liquid, steam or gas into the suction chamber of the jet pump. This, in turn, is entrained by the high-velocity motive stream emerging from the inlet nozzle. As the motive flow combines with the suction medium, some kinetic energy of the motive is transferred to the suction, mixing and discharging at a reduced pressure. The amount of pressure that can be recovered depends on the ratio of motive flow to suction flow, plus the amount of suction pressure built up in the suction vessel. Kinetic energy is converted back to pressure as the mixed media passes through the diverging taper and is discharged from the pump. 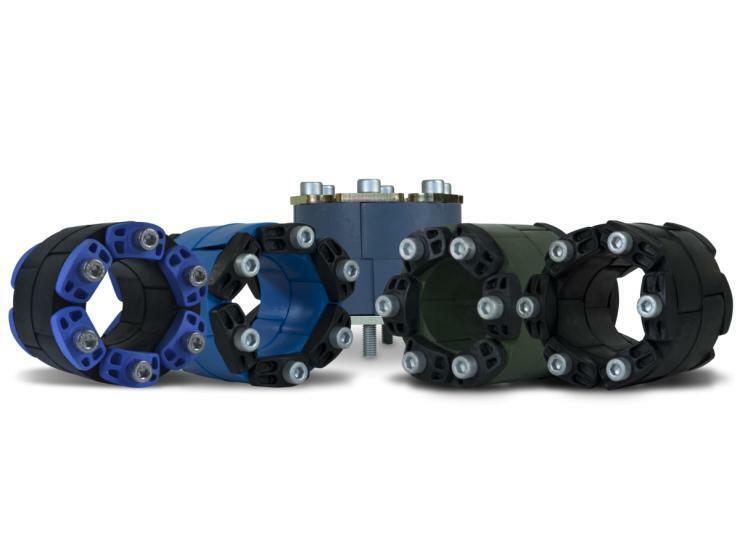 For more information about jet pumps and their applications, contact Piping Specialties, Inc. by calling 800-223-1468 or by visiting their web site at https://psi-team.com. 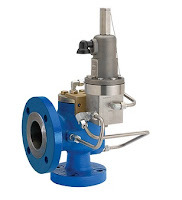 Here is a clear and well illustrated tutorial video demonstrating the operational principals of pilot and direct acting pressure relief valves. There are many available configurations of pressure relief and safety valves, each tailored to accommodate a particular set of application criteria. Understanding how these valves work is important to their proper selection and application to industrial processes and their control. 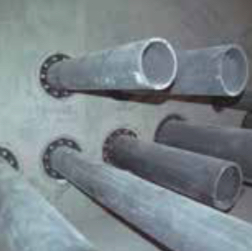 Safety mindedness is critical for these applications, and you should always talk to an experienced applications expert before specifying or installing these products. Product performance and selection information, as well as application assistance, is available from your local product specialists. Piping Specialties Inc. (PSI) is one of the northeast's largest suppliers of valves; process controls/instrumentation, and engineered mechanical specialties. These products are supported by factory-trained application engineers, shop personnel, and field service technicians. We also provide in-house design and CAD capabilities. Industries served: Power Generation, Pulp/Paper, HVAC, Water/Wastewater, Food/Beverage, Life Sciences, Chemical/ Process, Semiconductor.